There is a continuous debate over education – and rightly so as it is one of the biggest single issues facing Bermuda today. But improving our education system should begin and end with the quality of teaching and consistent and ongoing efforts to improve that quality. Our education system should prepare our students to be productive, well rounded global citizens which can be done by teaching and demonstrating what it means to be lifelong learners who are critical thinkers and good citizens, equipped for the 21st century economies and supporting industries. When learning new concepts and skills, children must have the opportunity to work with different tools – tools which will encourage student creativity – while working on new material which will help them grasp new concepts and ideas that will help them gain a deeper understanding of the subjects being studied. Children learn through the hands-on method, and there is a real place in our classrooms for project-based learning. In light of the above, I believe that it is important for teachers to make the classroom subject matter relevant to the lives of our students. Only then will they become more curious for further academic exploration. It is the Principal’s responsibility to ensure that teachers are given the time to plan and that they are provided with the materials to deliver positive learning experiences and outcomes. Teachers must then demonstrate the need for continuous learning and continuous improvement in students’ skills. Teachers are at the core of our children’s educational experiences. The quality of our teachers forms the cornerstone to our students’ academic success. In order to achieve academic success teachers should be adaptable and flexible. They also need to have an excellent relationship with students, the community the school serves and the parents. There needs to be an aggressive recruitment campaign to attract suitably qualified professionals. This can involve participating in job fairs, advertising in educational and teachers journals, getting involved with recruiters from leading universities as well as using social media outlets such as LinkedIn and Facebook. We could also have a more robust intern programme. On a more sensitive matter, the leadership of the Ministry should do more to mitigate the impact of missed instructional time. This include time lost from walk outs and any work to rule. We have had walk outs at TN Tatem, Dellwood, Harrrington School and Somerset Primary because of mold, and the state of the school campuses. We have had water challenges which led to the closure of Prospect Primary, Dame Marjorie Bean, Dellwood and Prospect Preschool. In conjunction with the Bermuda Union Teachers, these matters should be seriously examined and resolved. More should also be done to create a vision and culture for each school which should be led by the principal. The ability of principals to cultivate this type of culture should be at the heart of our vision for Bermuda’s principals, and should form a crucial part of the principal’s evaluation process. The Department of Education should also establish a robust parent complaints management system which could provide opportunities for improvements – which, in turn, will impact the delivery of education in Bermuda. Lastly, succession planning. The 2016/17 succession planning framework should be concluded and brought to life. This is crucial in that it will provide a strategy which will ensure the development of pools of qualified professionals will be available to fill key and critical roles in our education system as they arise. The programme will help identify talent gaps and can be used as a means of identifying training and development needs. It will eliminate the current staff shortage challenges that we have with our mathematics and science teachers. It will also help to ensure that the right people are at the right place at the right time. We need, also, to provide support for family and community engagement and we should consider establishing a subsidised parent academy, which will be open all year, to help our parents become full partners in our children’s education. This academy could create an infrastructure which will help align the services provided by the community and increase the number of partnerships with community based organizations, in order to create opportunities for parents to utilize community resources. The centre could provide parent workshops, computer literacy courses, and child care applications, along with continuing education and career counseling services. 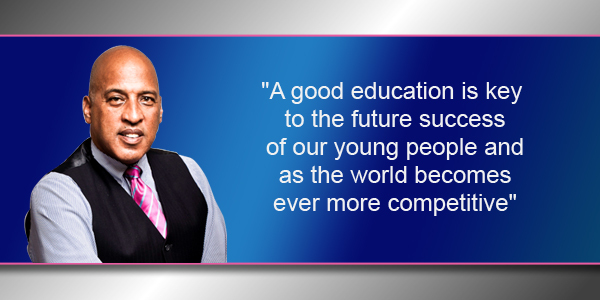 As we know, a good education is key to the future success of our young people and as the world becomes ever more competitive. The issues outlined here, while not a solution in themselves, could go some way to improving the overall culture of our education system and thus aid future success. I am sorry but a govt. that cannot operate a public bus transportation…or manage refuse pick up adequately….shouldn’t try to improve something else. I understand the cost of coolant is high and thusly prohibitive but you cannot operate air conditioning without it sooooo…import it yourself by the container if need be. OBA felt it was more important to spend over $70 Million on a sail boat race for Billionaires, so buses and trash trucks were run in the ground without proper matainance and new ones. But it was a nice sailing event. PLP was running up $400mn deficits, inclusive of so called cost ‘overruns’ for certain contractors and insiders, in 2012 and the issues were around then too. At least the AC boosted the economy as noted by credit rating agencies and evidenced by the drops in retail spending in 2018 when compared to 2017. Facts will never be your friend. Another parallel with you and Trump. Speaking of Trump, did OBA invite Rudy Giuliani to speak at their Gala,and is he Trump’s lawyer? PLP seem to not like foreigners, gays and people who don’t think or look like them. You lot are bermudas right wing and religous right. Again if you can’t see the blatant parallels then you’re dumber then you think. I always cringe when PLP and their supporters lambast the Republicans despite sharing the exact same ideologies across a spectrum of issues. President Obama gave 11 million ILLEGAL immigrants a pathway to citizenship. PLP and their supporters shut down or democratically elected Parliament if a few thousand LEGAL immigrants, who have been here for at least 20 years, were granted a pathways to citizenship. Many, including MPs, stated that such an action would change the ‘culture’ of Bermuda. No different than the Republicans and their supporters state regarding immigration. That’s just two examples of the shared traits between the PLP and Trump/Republicans. The fact that you can’t see the obvious boils down to you viewing the world in a simple black and white context. Two totally different scenerios, you will dare compare people desperatley looking for a better life, escaping certain death to someone who was given numerous work permit extentions because they had the “IN” at some excempt company and now have their hand out for citizenship.. Yes this is something we need to look very closely at.. Also note that the United States immigration policies should indeed be generous, but and Island of 21sq miles should be cautious and rightfully so, so please take your lame general comparasions elsewhere and allow the people of Bermuda to craft an immigration policy that is fair but not generous and that considers the Bermudian people, is that much to ask for? is that much to ask for? – I retract that statement, people are done with asking for their right to make decisions as Bermudian Citizens, we will advise you of what type if any residency you will get here..not the other way around. Don’t need you need to advise me of anything. I am just a s Bermudian an as you. And no it is any different. The only difference is what the people look like. Period. Can you please provide a source for your claim? If this so called “boost” was so magical why is it ppl are still in the same position if not worst after this “boost.” You can’t show nor prove the positive effects of this “boost” or how it has helped the common man in Bermuda. Bermuda doesn’t need a “boost” we need for sure money making ventures that will redefine our economy and the way we conduct business. And rather you like it or not Fintech will do just that!!! Prove me wrong. Well said! They can’t provide any evidence of the mythical $300+ million going into the people’s coffers! And PWC report is a fabricated joke of epic proportions! I just gave you two sources of to validate the boost to the economy. Just because you can’t understand them isn’t my problem. “S&P said, “The positive outlook reflects our expectations that, in the next two years, Bermuda’s economy will continue to see positive, although fading, real growth largely from revived tourism demand following the Americas Cup in 2017, and the effects of several large-scale construction projects. So as you can see, despite the PLP taking credit for this report earlier in 2018, the underlying drivers behind the decision was the AC and its after effects on tourism, large construction projects (ie Airport, hotels etc) which may I remind you the PLP were vehemently against as well as the fact tha the PLP is continuing the OBA’s fiscal prudent strategy. You are so full of BS. Every time you push AC and nothing to show for it! Some got rich and had a party and others got scraps. Put that in your PWC fake report! Just because you can’t understand the PWC report doesn’t mean it’s fake. It just means you don’t understand it. You just love your anti OBA embellishments , eh ? Yes, qualified and effective teachers are a key component. Do we really not already have those? If so, isn’t it the system educating them that is to blame? But I don’t believe this is the case. I don’t believe there is a huge difference between the quality/qualifications of the teachers in our public vs private schools. The most important component in a successful education system, in my opinion, are students who WANT to learn. If our kids don’t understand the importance of a good education, and the importance of taking advantage of the opportunities open to them while in school, then the best teaching in the world isn’t going to help them. If our kids aren’t willing to put in the time and effort needed while in school, their poor results is surely down to them. It’s a fact of life that increased effort = better results. You can’t blame a system for the disinterest and lack of effort of an individual. So how do we get our kids more engaged? This leads to another key component in the education system – parents! (as very briefly mentioned near the end of the published opinion) Perhaps parents who are paying 10s of thousands of dollars to send their kids to school have more reason to be involved in their child’s education. But all parents need to be involved. Instead of blaming the teachers and the system, we – students and parents – need to support our teachers by being an interested and involved part of what they’re striving to accomplish with and for our children. The visiting advisory teachers from Cambridge International Assessment indicated there was a problem with the quality of mathematics teaching. That might explain why the Cambridge checkpoint results were significantly below other juristictions including those in the developing world. To provide a law which coincides with livable wage is the clear way for the government to go. Thousands of Bermudians WILL benefit from such a law. Rolfe Commissiong did speak of this proposal on yesterday’s news. Hats off to the P.L.P. for putting specifics in place to support the hard-working Bermudian, who is being paid ” peanuts” , at this time. There will be layoffs a plenty in the way and you can help pay to support the crowd sitting in the wall! I am retiring this year so I am getting mine and you can wait for yours which will never come! Ahh Betty , It’s already been proven that the vast majority of people who will benefit from a minimum wage proposal will be foreigners !